It was nervy right till the last moment, and there were several times when you thought that the opposition had scored. Well, Arsenal were Arsenal yesterday. There’s never such a thing as an easy victory, when you are Arsenal. Coming into the first European game of the season, spirits were pretty contrasting in both the camps. Montpellier had a poor start to their defence of the French league title, losing 3 of their opening 5 games, while Arsenal looked marauding having thumped 6 over the weekend, a result that took them to 3rd in the English league. There were several changes that were expected to be made, by Arsenal. Laurent Koscielny, Andre Santos and Aaron Ramsey were due starts, but all were left on the bench, as Arsenal pursued with the winning formula. Per Mertesacker partnered Thomas Vermaelen in defence, as Kieran Gibbs continued at left-back. Abou Diaby returned after missing the Southampton clash. Olivier Giroud started against his former employers up front, along side Gervinho and Lukas Podolski. Walcott and Chamberlain were again on the bench. Arsene Wenger of course was serving his touchline ban, handed in by UEFA, whom Wenger claims, as to not knowing their own bloody rules. This meant Steve Bould was in charge of the proceedings. Surprisingly, Montpellier decided to go with a pretty attack minded unit. Young French midfielder Remy Cabella started, and so did star player Younes Belhana. Argentine striker Emanuel Herrera started from the bench, as there was a place in the starting lineup for Senegalese Souleymane Camara. Also starting was striker Anthony Mounier. The home fans had been urged to create an electric atmosphere, and they did. Drums, flares, chanting, whistles, the typical European crowds that we have experienced in the past. Arsenal made the slightly better start, but it was Montpellier who had the breakthrough in as early as the 9th minute, when Thomas Vermaelen was harshly adjudged to have fouled Belhanda on the edge of the box. The Morrocan ‘Pirlo’ed in the penalty, though Mannone did have a chance to make a point blank save. Arsenal, playing with just one striker up front in Giroud, got the equalizer soon enough. The French international, under immense pressure from compatriot, and ex-club mate Yanga-Mbiwa, held up the ball well, twisted and set up Lukas Podolski who had the easy task of tapping home the ball, with only the keeper to beat. And two minutes later, helped by more poor Montpellier defending, Carl Jenkinson burst on the right flank. His cross was not cleared, allowing Gervinho to tap home a simple second for the Gunners, to stun the home fans. Arsenal failed to create too many open chances in the first half. 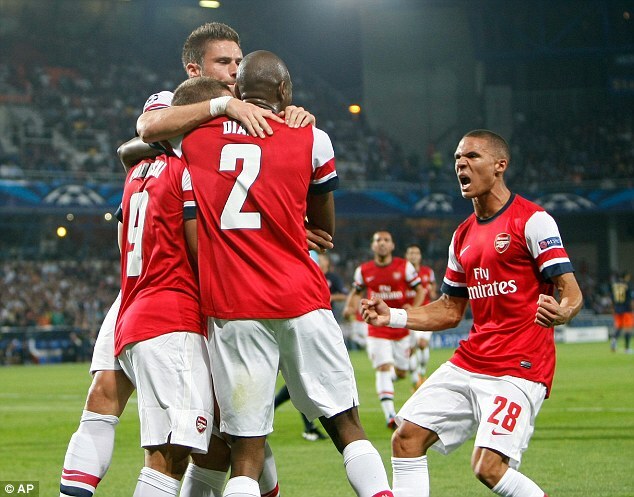 The Gunners did look more dangerous than the French champions though, with some neat play, but with little end product. A Kieran Gibbs cross late in the half, was pulled wide b Giroud, who had the tough task of keeping his former teammates, the duo of Yanga-Mbiwa and Hilton quiet throughout. The French side were a completely different outfit in the second half. The energy levels clearly seemed higher, probably after a half time talking from coach Rene Girard. A clumsy moment from Abou Diaby gave a great chance for Cabella to level matters, but he blazed wide. The home side stepped up the pressure, winning more free kicks in dangerous areas, and creating more chances, having dominated possession. Cabella had another go at goal, when he spotted Mannone off the line, but his chip could only strike the bar. Right back Bocaly had a couple of attempts at goal, but failed to trouble the keeper. While there was no doubt the French side had enough industry, they did lack a bit of composure and experience to get the goals and the result. Abou Diaby made a surging run through midfield to set up Santi Cazorla, whose shot was saved by Jourdren. A peripheral Giroud, who had taken in several body blows all night, was withdrawn, to a warm applause from the home fans. Montpellier than had the chance of the match when he found himself with time and space inside the penalty box, and only the keeper to beat, but took his shot too close to the keeper. Mannone saved his meek shot. Arsenal did escape with another penalty shout, right at the end, when the impressive Cabella, was fouled by Diaby inside the box, but the referee by now, used to the French side’s excessive diving tactics, decided to wave play on. Arsenal threw on Francis Coquelin and Theo Walcott late on, to hold on to the 2-1 win. This will be vital, as the season goes on, and should we seal early qualification, a chance for the manager to chop and change in the final group game. Positives, well, plenty. Steve Bould certainly thinks that the team has a great spirit, and a willingness to fight and grind out results. It was not the easiest of games, but the team got the job done. Lukas Podolski was immense on the night. Carl Jenkinson, too had a pretty good game I thought. Mikel Arteta did a good job of frustrating the opponents in the middle of the park. There are some negatives as well. There were several ocassions where possession was lost too easily, allowing Montpellier to have a go in the second half. Olivier Giroud cut a very isolated figure, and you can’t blame him. He got very little support and it is not easy to hold the ball all night long. He did have an assist to his credit though. Abou Diaby was sloppy several times, and could have even handed two goals with his poor judgement. Kieran Gibbs was slightly left bare, but overall the defence performed well, under a wave of pressure. So, a win is a win. And nothing like it. Time to concentrate on the next game. Manchester City away on Sunday, who played out a thoroughly absorbing contest with Real Madrid, in Spain, eventually losing 3-2 to the Spanish champions. Next: Is It Really “Too Early” for Arsenal?